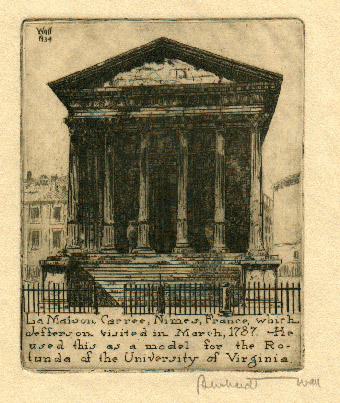 La Maison Carrée, Nimes, France, which || Jefferson visited in March, 1787. He || used this as a model for the Ro- || tunda of the University of Virginia. Publié dans : Bernhardt Wall, Following Thomas Jefferson 1743–1826. Lime Rock, [1933–38], tome 9.